It is another plane to Asia. 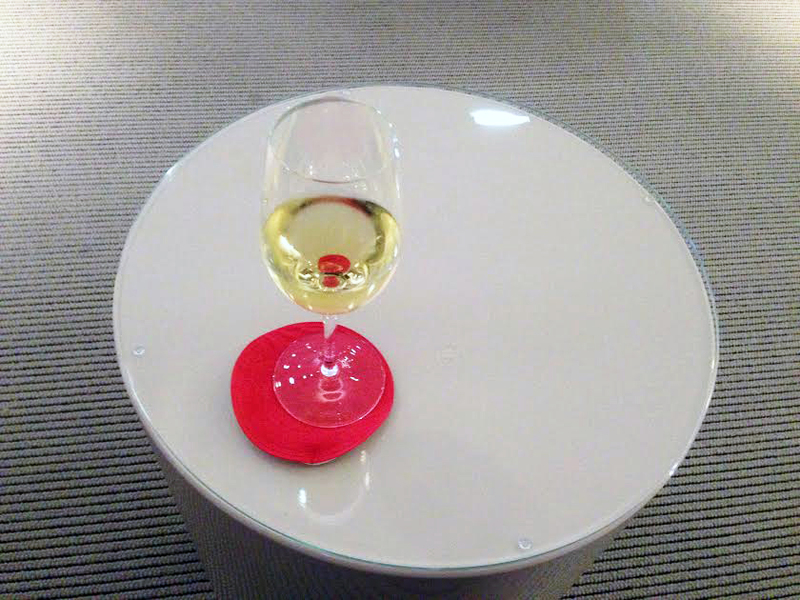 Being in the air during the Year of the Horse parties , a little glass of wine to celebrate another good start and encourage sleep before taking off. The red circle of auspicious beginnings and sweet dreams. A welcome dessert by Corrado, chef at 10 Corso Como Shanghai café. 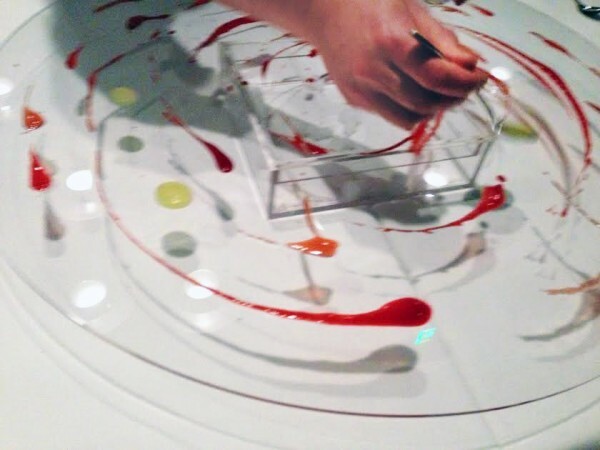 Designing the circles with a dripping technique using sweets and creams instead of oil paint. Edible art was recognized as a movement in the 20’s in England where artists, poets, and philosophers shared their passion for food and art. Today they have a website and sponsor shows in Asia and Europe. Their motto, “we are what we eat”. Since the 50’s American artist Wayne Thiebaud has made paintings based on images of food displayed in windows. His paintings of cakes, pies, ice cream, and pastries has made him famous, but he does not seem to consider his paintings food art, as much as an exploration of simplified forms charged with memories. 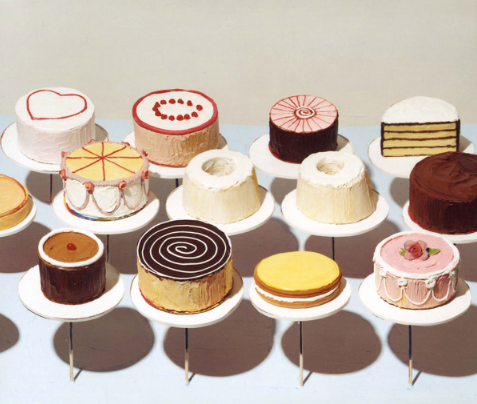 Here, Cakes, an oil on canvas from 1963. 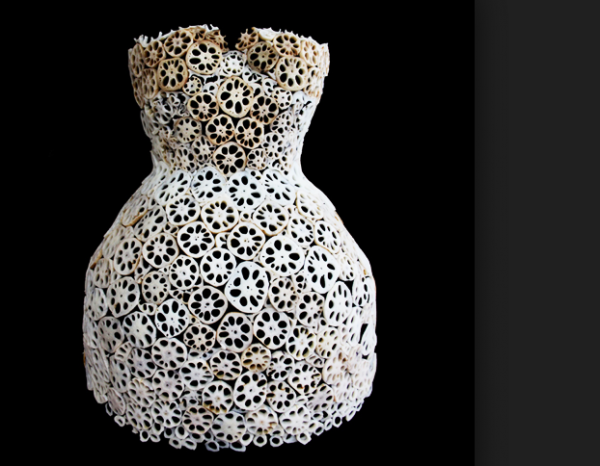 When it comes to edible art, Korean artist Yeonju Sung’s is amazing; made only of perishable food, and using a variety of ingredients, this wearable lotus roots dress is one of her more spectacular creations. Her point of view, seen here and through out all her work, is creating a “reality” that will disappear. As she says, “ultimately what you see is the images of phantoms”. Flemish baroque painting of the 16th and 17th centuries always is referenced to show abundance and beauty of food. 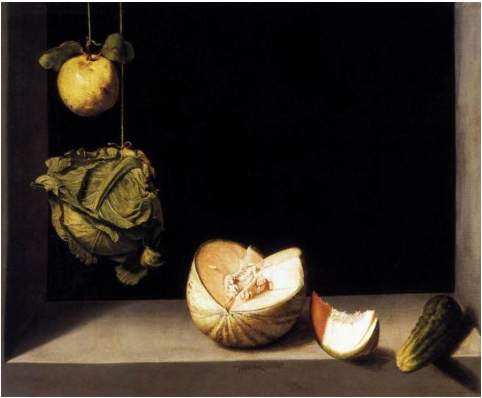 But this painting, from 1602 by Spanish still life painter Juan Sanchez Cotan who lived in a monastery, uses sumptuous light and shadow to show a simple cabbage. It is still studied for its beauty. 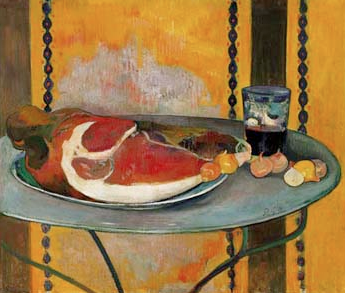 Still life with ham, a natura morta oil on wood by Dutch painter Floris van Schooten. 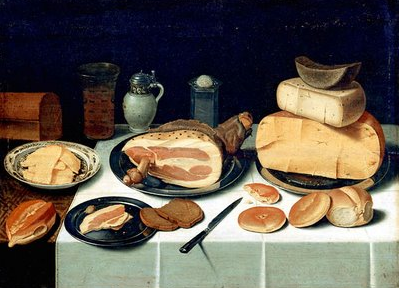 He painted many market and kitchen scenes, and table top compositions, such as this ham and cheese, seen here, always with dark ground so that the subjects are in sharp relief. 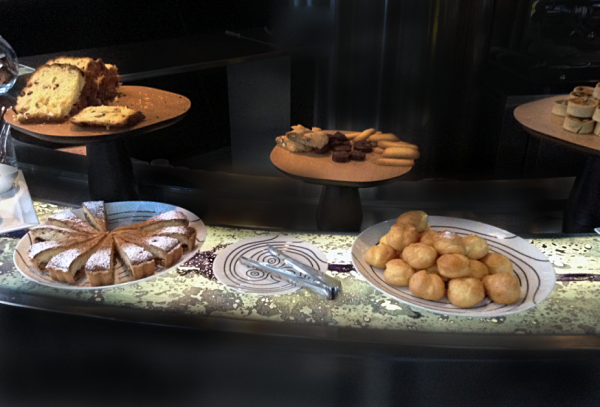 At the 10 Corso Como café in Shanghai, we have a new rendezvous for foodies. Once a week chef Corrado prepares the lounge bar in the colour of paintings from major themes in Italian art, creating a festive moment to stimulate the eyes and the appetite with a selection of sweet and savory amuse-bouche. Painted by Paul Gauguin in 1889, it is not hard to see how my mind could travel from Corrado’s aperitivo Italiano to Flemish painters, and Gauguin. I guess it is all a matter of beauty – never mind where, and when, or how we enjoy it.